As elaborated in "What Works Best? ", a strategic allocation involving perhaps five to ten equally weighted asset classes available via low-fee exchange-traded funds (ETF) or mutual funds, with periodic rebalancing, is a simple way for individual investors to harvest uncorrelated volatility over the long term. For investors seeking an active (tactical) edge, there is evidence supporting exploitation of intermediate-term relative momentum of asset class proxies. Holding a few top-performing funds (rather than just the top fund) combines continuous diversification and momentum. For the set of strategies described here, we allocate at the end of each month all funds to the top one (Top 1), the equally weighted top two (EW Top 2) or the equally weighted top three (EW Top 3) asset class ETFs from a set of nine, based on total return over recent months. "Adjust the SACEMS Lookback Interval?" re-examines the optimal lookback interval for SACEMS based on accumulated historical data. "Simple Asset Class ETF Momentum Strategy" [down for update] investigates systematic rotation to a proxy for the best-performing asset class. "SACEMS Top 1 Mean Reversion?" presents detailed tests exploring interaction of SACEMS ranks and lookback intervals. "SACEMS Applied to Mutual Funds" repeats tests in the preceding item on a set of mutual funds that are reasonably similar to the ETF universe used in them, but with a longer history. "Alternative Momentum Metrics for SACEMS?" tests some momentum metrics other than simple return over a specified past ranking interval. "Robustness of SACEMS Based on Sharpe Ratio" investigates one of those metrics in depth. "'Current High' Boost for SACEMS?" tests adding a filter that restricts monthly asset selections to those currently at an intermediate-term high. "SACEMS with Momentum Breadth Crash Protection" investigates crash protection via momentum breadth (proportion of assets with positive momentum). "SACEMS Based on Martin Ratio?" tests another ranking metric. "SACEMS with Risk Parity?" tests an alternative to equal weighting of SACEMS portfolios. "SACEMS-SACEVS Mutual Diversification" tests benefits of diversifying across asset class ETFs based on both relative momentum and relative value. "SACEMS-SACEVS Diversification with Mutual Funds" provides an extended test of the benefits of diversifying across asset classes based on both relative momentum and relative value with sets of mutual funds. "Simple Asset Class ETF Momentum Strategy as Diversifier" tests whether the strategy is a good diversifier of the U.S. stock market. "SACEMS with Three Copies of Cash" and "SACEMS with SMA Filter" test alternatives requiring that all SACEMS positions have either positive real past returns or are in technical uptrends, respectively. "SACEMS with Different Alternatives for 'Cash'" tests alternative "risk-free" assets as cash substitutes. "SACEMS Portfolio-Asset Exclusion Testing" and "SACEMS Portfolio-Asset Addition Testing" explore how specific assets contribute to a relative momentum set. "More International Equity Market Granularity for SACEMS?" looks at a modestly finer breakdown of regional equity markets for the strategy universe. "Combining Sector and Asset Class ETF Momentum" adds nine sectors to the mix of asset choices. "SACEVS and SACEMS from a European Perspective" investigates the effects of the U.S. dollar-euro exchange rate on strategy performances, addressing the perspective of a European investor. "Effects of Execution Delay on SACEMS" looks at effects of delaying action on changes in winner portfolios for up to 21 trading days. "Slow Down or Speed Up SACEMS with Volatility?" and "Asset Class Momentum Faster During Bear Markets?" focuses on performance of SACEMS under different equity market conditions. "Add Position Stop-loss to SACEMS?" tests whether adding an intra-month stop-loss rule to the strategy improves performance by avoiding downside volatility within the strategy. "Add Position Stop-gain to SACEMS?" tests whether adding an intra-month stop-gain rule to the strategy improves performance by harvesting upside volatility within the strategy. "SACEMS at Weekly and Biweekly Frequencies" examines whether weekly or biweekly rotation signals outperform monthly signals. "SACEMS at a Bimonthly Frequency" does the same for bimonthly rotation. "Optimal Monthly Cycle for SACEMS?" investigates whether using a monthly cycle other than end-of-month to determine winning assets improves strategy performance. "Simple Asset Class ETF Maximum Momentum Strategy" tests an alternative approach that that measures ETF returns from the lowest daily close within the momentum measurement interval rather than the monthly close at the beginning of the momentum measurement interval. "Simple Asset Class Leveraged ETF Momentum Strategy" investigates whether using leveraged versions of asset class proxies improves strategy performance. "SACEMS with Margin" and "SACEVS-SACEMS Leverage Sensitivity Tests" alternatively explore use of margin rebalanced monthly to boost SACEMS performance. "Sticky SACEMS" tests whether limiting the trading of the strategy by holding winners until they drop out of the top one, two or three is effective. "Buffered Winner Asset Class ETF Momentum Strategy" tests whether limiting the trading of the strategy by continuing to hold a past winner until it loses to a new winner by a significant margin is effective. "Limited-choice Asset Class Momentum Strategy" tests whether limiting choices of assets to equity-like (other) asset classes during U.S. bull (bear) markets is effective. "Asset Class ETF Momentum Winner Performance by Calendar Month" quantifies average strategy performance by calendar month. "SACEMS vs. Luck" examines how the strategy stacks up against pure luck. "SACEMS and SACEVS Changes for Coordination and Liquidity" documents minor April 2017 adjustments that trade purity of logic for practicality. "SACEMS Data Changes - January 2018" documents changes in past source data. "SACEMS Data Changes - May 2014" documents changes in past source data. "Model Momentum Strategy Adjustment" documents a September 2012 change in specifications for the tracked strategy. Some investors may want to follow one of the alternatives tracked here. Others may want to adapt them with modifications suited to their individual goals and constraints. Still others may want to apply the analysis approaches to stress other strategies. Something to keep in mind is that adding complexity to the strategy increases the number of ways to optimize and thereby elevates potential for data snooping bias. 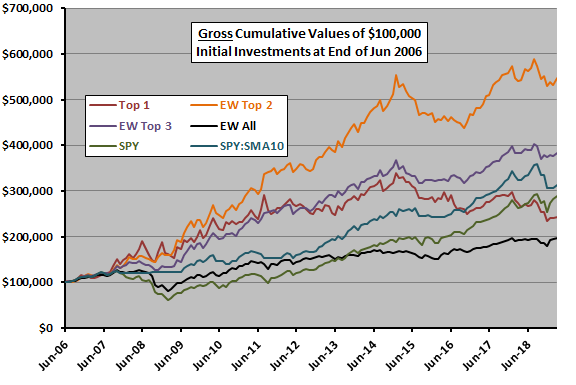 The following chart shows the gross cumulative values of $100,000 initial investments in Top 1, EW Top 2 and EW Top 3 portfolios since the end of July 2006 (when all ETFs considered are available). 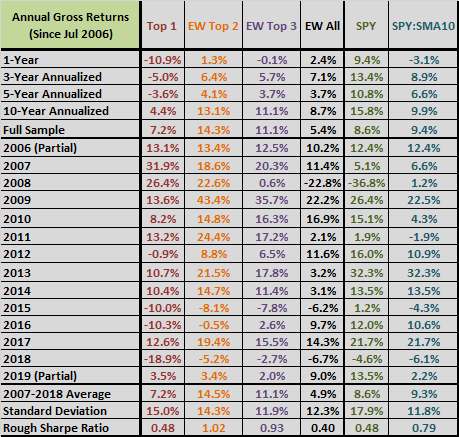 The chart includes three benchmarks: (1) an equally weighted, monthly rebalanced portfolio of all ETFs considered (EW All), indicative of simple diversification benefits; (2) buying and holding SPDR S&P 500 (SPY); and, (3) SPY:SMA10, a simple timing strategy that holds SPY (Cash) when the S&P 500 Index is above (below) its 10-month simple moving average. The following table summarizes some monthly statistics for these same strategies over the available sample period. Maximum (peak-to-trough) drawdowns are based on monthly measurements over the available sample period. The next table summarizes annual/annualized returns for these strategies over different intervals commonly used to describe performance of funds. The annualized returns are compound annual growth rates. Only the longest measurement intervals include a major equity bear market.